A Chinese provincial government delegation is visiting Bulgaria to study investment opportunities offered by the EU member state, the Economy Ministry in Sofia announced on Wednesday. 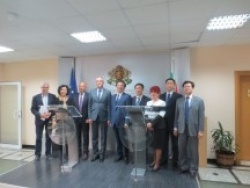 The delegation comprising local government officials from the city of Qingdao, in Shandong province in eastern China, and representatives of Qingdao Free Trade Zone met with Bulgaria’s Economy Minister Bozhidar Lukarski. “It would be only natural for potential Chinese investment in Europe to be implemented through Bulgaria which traditionally has the best relations with China among all EU member states,” Lukarski said during the meeting, according to a statement released by the ministry. The Chinese delegation will visit the Euro-Chinese Economic Development Zone, which is part of Trakia Economic Zone, in southern Bulgaria, and will study the opportunities offered by Plovdiv Airport nearby as well as the Black Sea ports of Varna and Burgas. China’s central government has tasked Qingdao Free Trade Zone with implementing the so-called Silk Road Strategy – investing overseas, primarily in Central and Eastern Europe, according to the statement.